When the season of last-minute potlucks and big family gatherings arrives, it's helpful to have a few easy holiday vegetarian recipes in your back pocket to pull out. This is especially true if the smorgasbord you're likely to encounter is heavy on meat. These easy holiday vegetarian recipes are ideas sure to please everyone, and all of the below recipes take less than an hour to make, work well as side dishes for any holiday meal, and are simple to transport and reheat or chill. Sweet or savory mixed nuts are one of the easiest holiday recipes to prepare, and they're a great appetizer for guests to nosh on while they wait around for the main course. Drop the nuts into a bowl, and sprinkle the sweet or savory spice mix over them. Drizzle on the oil, and toss with your hands to coat evenly. 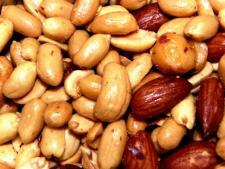 Spread the nuts on a baking sheet and transfer the sheet to the oven for 15 minutes. Remove and jiggle the nuts halfway through to ensure even cooking and no burning. Let the nuts cool before serving. A truly easy holiday vegetarian recipe involves so few ingredients that it comes together in only a couple of minutes. 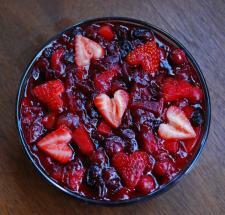 The below recipe for cranberry sauce fits the bill and comes out delicious every time. Place the sugar and orange juice in a heavy-bottomed saucepan that is big enough to hold the cranberries. Heat the pan on medium over the stovetop until the sugar dissolves. Continue to heat the sauce for 10 to 12 minutes or until the cranberries begin to pop. Remove the sauce from the heat and let it cool or chill before serving. Garnish with the fresh fruit slices. Stuffing is the quintessential holiday dish, but it's almost always made with poultry-based ingredients. 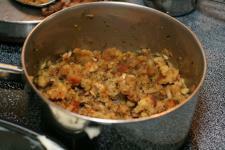 Below is a meatless version that makes one large pan of stuffing. Melt the butter in a heavy-bottomed saucepan over medium-low heat. To make the recipe vegan, use olive oil instead. Add the chopped onion and celery to the melted butter or oil, and saute until the vegetables are transparent and beginning to brown, eight to 10 minutes. Add the vegetable broth and spices, and bring the mixture to a boil. Allow everything to boil until the stock has slightly reduced and the flavors are concentrated, about three to five minutes. Remove the mixture from the heat and stir in the bread cubes. A hot pan of roasted veggies requires almost no hands-on work, but it serves in a pinch as a healthy and delicious main dish for vegans and vegetarians when there are no other meat-free options. In a large bowl, combine all of the sliced vegetables with the salt, pepper, and olive oil. Toss evenly to coat. 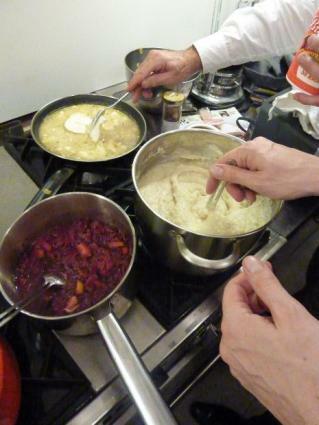 Divide the mixture among baking dishes lined with aluminum foil, and transfer the dishes to the oven. Roast the vegetables for 45 to 60 minutes, until they are browned and beginning to crisp. Finish them under the broiler if necessary. Serve the vegetables with pesto sauce or fresh basil. Each of these holiday dishes delivers fantastic flavor that all of your dinner guests can appreciate. The fact that they're also vegetarian is almost beside the point once you taste them, but knowing they're vegetarian will add to your satisfaction.